An Wikipedya Mis Asiek eus an online edit-a-thon aimed at enhancing understanding among Asian Wikipedya communities. 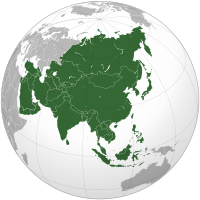 Taking place throughout November 2016, the purpose of Asian Month on the English Wikipedya is to improve the quantity and quality of articles relating to Asian countries. Last year, over 7,000 articles were contributed in 43 languages in Wikipedya Mis Asiek. As a symbol of friendship between Wikipedya's Asian communities, each participant who creates at least four (4) articles that fulfill the criteria will receive a specially designed Wikipedya postcard from other participating countries. Wikipedians who create the most articles on each Wikipedya will be honored as "Wikipedya Asian Ambassadors". In a nutshell: Create new articles relating to Asya (people, places, culture, etc. ), 3,000 bytes and 300 words minimum, with sources, dres mis Du 2016. Rolyow na gwul qualify. An article is newly created by you (i.e. not expanding stubs) between November 1, 2016 0:00 and November 30, 2016 23:59 (UTC). An article must fulfill the notability criteria. An article must have decent references; doubtful or controversial statements in the article should be verifiable by the citation(s) listed in that article. An article must not be purely machine translated, and must have a decent language style. There must be no issues (no tags) within the article. An article should not be a list. In the end, human judge(s) from the local Wikipedia will determine whether an article is accepted or not. You can sign up anytime. Organizers will mark (check) if the articles made fulfill the criteria. Diwettha chanj an folen ma a veu an 4 Du 2016, dhe 00:11.